130 years of Franco-British friendship in London...and counting! The new .london domain first went live in 2014 for a specially selected group of London companies and we were delighted to have been chosen as a pioneer for dot London. The new domain celebrates London's position as an open, global city and the Alliance has been playing its part in that since 1884. We are committed Londoners who have been around for 130 years and we welcome people from all over the world. In 1884 (the London Alliance was one of the very first Alliance Française in the world), the people involved in setting it up were four teachers/lecturers, three merchants and one banker. By November 1885 they boasted of having signed up «quelques-unes des personnes les plus influentes de la Colonie française à Londres». On the agenda that month, getting the French primary school in London to re-open and how to maintain the use of the French language in the Channel Islands. In the next few years, a number of associated societies sprung up in and around London: Le Centre de Londres, Le Comité du Sud de Londres, La Concorde, Paddington, Richmond, Highgate, East Dulwich, Ealing, Balham; followed by Le Trèfle, La Gauloise, L’Amical, Les Concerts Français, the North-Western Polytechnic, the Queen’s Road Commercial Institute, the Modern Language Association London Branch. This list shows that individual ventures first, then education institutions, came under the banner of the Alliance, all intent on promoting the French language and culture, spreading l’esprit français and ensuring le développement de la sympathie pour la France. Similar societies started appearing in the provinces, e.g. the Société Littéraire française Alliance Française in Liverpool in 1886. Their main activities were lectures (some with limelight illustrations), soirées dramatiques and book-lending services. Strikingly these local endeavours surmounted the difficult time for Anglo-French relations that was to follow shortly: indeed the Dreyfus affair (1894), Fashoda (1898) and the Boer War (1899-1902), occasions of colonial rivalry, political tension and anglophobia, did not exactly augur well for an entente cordiale, although they paradoxically led to it. So it is all the more remarkable that francophile groupings sprung up and developed in parallel to these dramatic events. The London groups and a number of provincial circles all over the British Isles joined in coordinating their activities through a London bureau, in existence by 1904 but formally set up in 1908 at the Franco-British Exhibition in White City, a popular showcase of Franco-British cultural and commercial ties. A commentator noted that "il ne s'agit rien de moins que de donner une sorte de prolongement culturel à la politique de l'Entente Cordiale." Such London-based coordination would strengthen and develop the intellectual bond between Britain and France. As a consequence, the London Alliance which had started coordinating tours of speakers round the British Isles in 1889, was able to invite eminent speakers over from France, offer a nationwide cultural list, and raise the profile of the organisation. But it would remain faithful to its aim which was « captiver l’intérêt de tous en embrassant dans les sujets de ses conférences toutes les manifestations de la vie et de l’esprit de France »: the Alliance was always more Town than Gown. Apart from this cultural programme, regular events took place in London: films, once the Alliance had acquired a lanterne cinématographique; talks, at the Steinway Hall for example where they attracted large audiences; banquets, at the Café Royal for one where some 300 distinguished guests mingled. The Alliance also organised school exchanges, a bi-yearly visit to France, bestowed medals of achievement to pupils and teachers, oversaw a book-lending service and published a Review. The idea was to inform audiences of what was happening in France, culturally and socially, but also "les Français apprendraient à connaître les Anglais". Early on the mission statement was clear: anglophile French and francophile British would share in their love of all things French. And this dialogue of cultures promoting mutual understanding still stands as a perfect summary of the Alliance’s mission in London today. 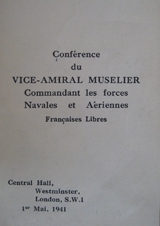 Notably the Alliance was a pioneer in teaching business French: The first “cours commerciaux” were launched in London as early as 1894, and “cette nouvelle création ne manquera pas d’augmenter les points de contact avec le monde des affaires dans ce pays commercial par excellence ». Indeed the Alliance was one of the early members of the French Chamber of Commerce in London, founded in 1883. And at its gatherings it would have a commercial section as well as a literary section. It expanded its teaching activities with a programme of classes in general French in 1955, one of the very first cultural organisations to do so. Friendship can endure in times of hardship: During WWI the London Alliance and several provincial French Circles carried on with lectures and events, but also raised money, knitted and prepared parcels for the soldiers at the front. 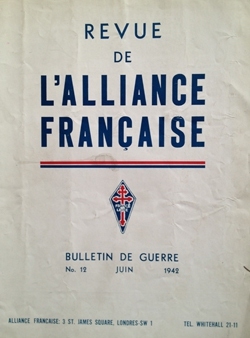 During WWII, the London Alliance’s mission took on an added significance when it became the acting headquarters for the world network after the occupation of Paris in June 1940 and "le point de ralliement de tous les Alliés"; one way was publishing a news-bulletin disseminated worldwide; also, organising talks in schools and in French Circles throughout Britain, and Allied tea-parties in London. The Alliance was at the outset, and is today, a non-political organisation but the war made an exception of that. It was felt that certain cultural values had to be preserved and the Alliance française de Londres aligned itself from day one with General de Gaulle, the Free French and their British Allies. 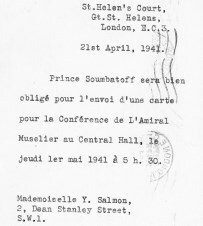 It is remarkable that over some 40 years, 1903-1945, the Alliance’s driving forces were Prof. A. Salmon and M. F. Thémoin, two eminent professors of French in London, who passed the flame respectively to daughter Yvonne and son Louis. 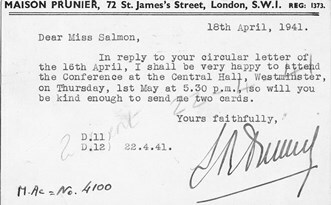 The kingpin of the Alliance was Yvonne Salmon, Secretary General of the organisation between 1921 and 1945, also translator of Thomas Hardy and early biographer of General de Gaulle. She also had overlapping active involvements in several French associations, e.g. the Français de Grande-Bretagne (the “civil wing” of the Free French) and the Association of French teachers in Britain. More about Yvonne Salmon can be found here. Some very influential people actively supported the London Alliance. In the 1930s, André Simon, charismatic leader of the English wine trade, at the time a shipper for Pommery champagne, and later founder and president of the Wine & Food Society, was its president. Jacques Cartier, one of the brothers in the Cartier family of jewellery fame, who opened Cartier of London in 1902, followed on. His successor at the helm of Cartier, Etienne Bellenger, was also involved in the Alliance, and, during WWII, he designed insignia for the Free French and for the Alliance. So some sparkle to our history! There was also some literary weight in the post-war years when the Nobel prize-winning poet T. S. Eliot and novelists Charles Morgan and Graham Greene joined us too. Today, with an expertise developed over decades, the Alliance provides scheduled classes and individual and corporate tuition, given by fully-qualified, native French-speaking tutors, using state-of-the-art technologies and teaching methods. The aim is for students, of all ages and all backgrounds and nationalities, all francophiles with a keen interest in everything French, to experience a truly authentic French atmosphere as soon as they step through the doors of Alliance House, an historic building in the heart of Marylebone. This page is an extract from research in progress. You are welcome to quote any of the above but it will be appreciated if you would kindly acknowledge this page and include a link to it.